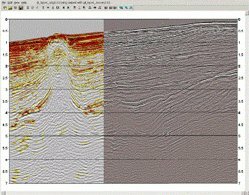 Veritas wanted a powerful and cost-effective new way to display their seismic data library to potential clients. Historically, data sales representatives had used third-party products that required format changes and multiple copies of the data. More recently, clients would be invited to the company’s visualization centers to work with highly detailed displays of huge data volumes. This was both expensive and time-consuming. While developing an in-house package of seismic utilities (collectively known as Vega), the marketing potential for using components in this package to bring virtual data to the client’s doorstep was quickly realized. By taking advantage of the new EXPOSE module and adding a few inexpensive peripheral devices to their laptop computers, the Veritas marketing staff could carry huge volumes of the company’s data library with them and offer customers the ability to visualize and interact with the data onsite. Vega was initially targeted for Unix, and Veritas decided to use both Motif and INT GeoToolkit C++ for the graphical development environment. When the requirement to run on both Windows and Linux became a high priority, Motif was replaced by Qt, a cross-platform GUI development environment. Switching to Qt involved a rewrite of all of Veritas’ own Motif GUI code. However, almost no change was required for code that had been developed with INT’s GeoToolkit — a major benefit of GeoToolkit’s platform independent design. Functionality for the portable version of EXPOSE included the ability to zoom in and out of the seismic data, scroll, change scale, change colors, change gain, and look at RMS amplitude values on specific anomalies, and perform comparisons between different sections. Most GeoToolkit display primitives are now fully integrated into Qt Designer, simplifying the task of enhancing existing applications or writing new modules. The next steps involved the addition of laptop systems for new users while developing logical add-ons to the software. This technology was later applied to 3D data volumes and deployed in other regions. Veritas is a geophysical service company that offers the oil and gas industry a comprehensive suite of integrated services designed to manage exploration risk and enhance drilling and production success worldwide.